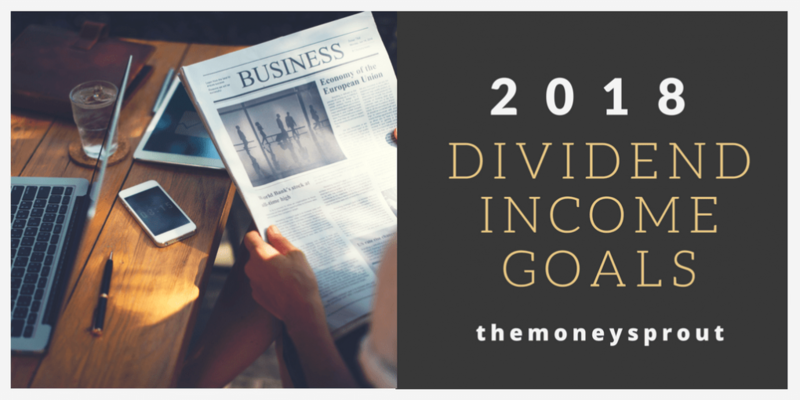 It’s that time again where we set our goals for annual dividend income. Just last week we reported a record dividend income month (December 2017 earned $448.58) as well as our highest annual dividend income ever (2017 earned $2,651.43). So I figured we would keep that momentum going with our 2018 goals and predictions for growing and earning dividend income. Starting in 2018, we are going to do something a little different than the past. For years (since 2011) we have been tracking our dividend stocks held in our regular old taxable accounts. These accounts include – Stockpile, Robinhood, Fidelity, and transfer agents (i.e. Computershare). These are all just regular brokerage accounts. Any of the dividends we earn from these accounts is included in our total adjusted gross income numbers reported on our tax return each year. Since we are long term buy and hold investors, the majority of this income is considered to be qualified dividends. So what’s new for 2018? Well, we have been starting to build out our tax deferred dividend income streams from a Rollover IRA we opened up back in 2017. We had several retirement accounts from past employers sitting out there and were paying huge fee’s for owning some not so impressive mutual funds. Well, one day last year we finally woke up and put an end to those high fee’s. We ended up rolling multiple accounts into a new IRA, selling off most of the high fee mutual funds, and started building out our latest dividend income portfolio. So in 2018, we plan to report on both our existing taxable dividend income stream as well as our new tax deferred income stream. Below you will find a breakdown of each account with goals as well as a combined set of goals. In 2018, we would like to increase our annual dividend income to $3,300 in our taxable accounts. That would be a 24.5% increase compared to 2017. In order to reach this goal, we must continue to make investing in the best blue chip stocks a priority, while reinvesting all our dividends throughout the year and receive company dividend increases. Here is a look at our past dividend income results (2011 – 2017), along with our projected annualized dividend income for 2018. After blowing past our dividend income goal last year by $251.43, we are able to adjust our 2018 numbers up a bit. In order to reach this goal, we will need to increase our our dividend income by ~$650. After increasing our dividend income last year by over $700, I think this is a realistic goal. How Do We Increase Our Dividend Income by $650? In order to give ourselves a shot at hitting our goal, we need to have a plan in place to bump our dividend income by $650. For starters, we will begin with our 12 month forward dividend income total … which is currently at $2,830.65. Basically this number represents the amount of dividends we would earn in the next 12 months without doing anything. That means no new investments, no company dividend increases (or decreases), and no dividend reinvestment. From that point, we need to come up with another $469.35. One of my favorite things about investing in quality dividend stocks … is the compounding that happens without any work from us. What I have observed over the years is that on a weighted average, our dividend income grows by 6% (actually 6.17%) per year from company dividend increases. The companies we invest in almost always increase their dividend payouts each year. In addition, we currently reinvest all of the dividend income we earn. Sometimes this is with DRiP and other times it is buying a few shares of stock in our Robinhood account. What we have also observed is that this gives us another 2% bump in income (conservatively). So combined, we can expect about an 8% increase from company raised dividends and reinvestment’s. This is back of the envelope type of math, but at least it gives us some estimates. Based on all of this, we can expect an additional $226.45 of dividend income on top of our 12 month estimates listed above. This means we need another $242.89 to hit our goal … which will come from new investments. An extremely conservative estimate tells us we need to invest around $12,000 next year to earn another $240+ in dividend income. This calculation assumes a 2% dividend yield on new stocks we purchase. On average, I would expect this to be closer to 2.5%, which means we need less investments. We also need to remember that these new investments will be made throughout the year and won’t be able to earn a full 12 months worth of dividend income. So that is why we are figuring low on our 2% yield. Based on all these factors, we came up with a rough estimate of $3,297.10 in dividend income earnings for 2018. Again, this figure assumes many different factors, but at least gives us something to work from. Even though we are still focused on building dividend income with these assets, we took a little more of a conservative approach. We invested about 22% of our assets into a low cost index fund. In addition, we put another 10% of our assets into a total bond market fund. The remainder of our assets are invested in either blue chip dividend stocks or are in cash. Note – The assets in the low cost index fund and bond fund will still produce dividend income (but not as much as our stocks). These numbers are included in the estimates below. Since we don’t have the history in our tax deferred account as we do with our other accounts, we are basically starting from scratch. Our goal for 2018 is to earn $3,400 in dividend income. How Do We Plan to Earn $3,400 in Dividends? Our current 12 month forward dividend income in this portfolio is currently at $3,140.88 … so we are close to our goal already. If we can assume the potential for an 8% increase again (from company dividend increases and reinvestment’s), we can knock off another $251.27. We won’t have the opportunity to invest as much in our tax deferred account because of contribution limits ($5,500 for me) and because of the amount of money we have available to invest. We do have some more cash available in our account that can be invested, which should give us a little bump. For now, we will stay conservative with our estimates as this portfolio is not as diversified (14 stocks, 1 index fund, 1 bond fund) as our taxable account (33 stocks). Because of the uncertainty with this account right now on new funds, we won’t factor any of those into our projections (for now). Between our 2 different accounts, we have conservatively estimated earning $6,700 next year in dividend income. About half of that will be working in a tax advantage account, while the other half will be included in our adjusted gross income. And since we don’t have any history of combining these accounts, we are again starting from scratch with our estimates and goals shown below. We already covered in each section above how we plan to hit these goals. And I want to state again that I like to estimate on the conservative side. Earning $6,700 this year in dividend income is not an easy goal, but it is certainly attainable and realistic. I wanted to stop for a moment and discuss the rule of 72 calculation that I covered a few months back. For more information on this calculation, check out our article – How to Double Your Income Every 9 Years. We already know that if we left our portfolio alone and simply reinvested our dividends (2%) and collected company dividend increases (6%) each year … our portfolio could grow by 8% annually. I would like to be able to cut that time frame in half … which I think is possible. So instead of increasing our dividend income by 8% annually, what if we could increase it by 16% a year? I could keep going but you get the idea. These number are just some simple back of the envelope calculations that make many assumptions. But they give us something to shoot for and make all this a lot of fun. Based on our 2017 dividend income results and growth, I am looking forward to what 2018 has to offer. Pushing our dividend income to $6,700 or above in 2018 will help us take one step closer to reaching Financial Independence (FI). Dividend income isn’t are only path to FI … but rather an important part of our overall strategy. One last thing … the stock market has gone absolutely crazy the last couple months and everyone is worried about a crash. I will admit that this has crossed my mind when thinking about investing new dollars into the market. But when it comes down to it … I want to keep our dollars working for us at all times. While a big correction may hurt our net worth numbers in the short term … it would give us a chance to buy dividend companies on sale … which can provide more potential income for years and years to come. Therefore, our investment strategy will remain the same for 2018. Continue to invest when we have the available funds, by using our 8 step process for selecting dividend stocks. This strategy has worked well for us the past 8+ years and we will continue to follow it.